We generally know how it feels to be physically fit. We move around with minimal discomfort, our breathing is clear, our body has more muscle than fat, and our energy and strength lasts all day. But do we know what emotional fitness looks or feels like? The men and women who live at Kendal at Oberlin exhibit many of these characteristics and here are 4 reasons why. Residents have lots of opportunities to be “students,” and they take advantage of them. Some residents, like Grover Zinn, are both student and teacher. 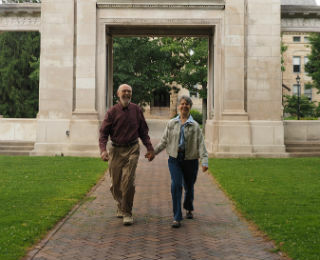 A retired Oberlin College religion professor, Zinn audits classes at Oberlin College (at no cost), and teaches classes in the Center for LifeLong Learning. The center is affiliated with Lorain County Community College and offers classes for adults, 50 and older, at various locations, including Kendal. Harol Pesuit, who chairs the Lifelong Learning committee, says the classes are stimulating, convenient and offer opportunities to meet people from the larger community. “It’s a nice learning experience without the pressure,” she said, adding that some students even knit during class. Every month, residents can participate in domestic and foreign affairs discussion groups and attend “Third Thursday Lectures,” which cover a range of topics including resident travel experiences. “Even if you can’t travel far from Kendal, you can travel through the lectures,” Harol says. Volunteering at Kendal and in the greater community is a common practice among residents. Thelma Morris was a founding member of Publicity Plugs, a group of residents who connected with Oberlin public schools to write periodic articles on people and happenings of interest, for local and regional newspapers and online services. She stepped down from those activities in 2010, but she’s still busy. Currently she serves on the staff-resident safety committee, assists the low vision support group, chairs the Eureka! literary magazine board, and is on the resident archive committee, which collects newcomers’ biographies and maintains the current and memorial records. She edits materials from the Hospice of the Western Reserve bereavement team for its newsletter, About Grief. "I find that volunteer work gives me more than I give it," she says. Being a volunteer gives her a "connection" and "community," she explains, and is one of the many reasons she calls retirement "the best years of my life." Thelma’s story is not unusual. Residents annually donate about 48,000 hours of service to nonprofits in Lorain County. Experts will tell you that reaching out to others adds purpose to your life, thereby enhancing your emotional health. Also volunteerism is associated with living a longer life. Forging new relationships, with people of all ages, is also common. Residents get to know students in the public schools and Oberlin College through mentoring and volunteer programs. Many residents also volunteer at the early childhood center, located on the Kendal campus. And meeting other older adults is easy, given the welcoming atmosphere at Kendal. Residents are encouraged to wear nametags, and the Newcomers and Friendship Committee helps new residents integrate into the community. When Kay Rider moved to Kendal from Arizona two years ago, she did not know anyone. “It was the hardest thing I’ve ever done,” she says. Kay has made many new friends, both at Kendal and in Oberlin, through her church and volunteer activities at the hospital and museum. “I’m doing everything I want to do and am enjoying it,” she says. With more than 90 committees, interest and support groups, along with a strong resident council, Kendal is very much a resident-driven community. “Everything we do is decided on by the residents,” says Robert Taylor, past president of Kendal at Oberlin Residents Association (KORA) and a former Kendal board member. Residents publish a monthly newsletter and maintain their own website. CEO Barbara Thomas holds two monthly meetings for residents, with plenty of time to ask questions and voice concerns. “There are plenty of opportunities to be heard,” Robert says. In fact, one of the committees is charged with just that—the Suggestions and Concerns Committee. While respectful of individual interests and abilities, Robert and others remind residents that if they appreciate a certain aspect of the community, such as the three art galleries featuring original art, “somebody’s making that happen.” That “somebody” is a resident.